When Tracy sent me some of the new My Minds Eye 'Lost and Found' papers to play with, I just did not want to cut them up! They are so sparkly and pretty, I just adore them! But, in the end, they were too gorgeous to just sit in my paper box and so I got stuck in! * Kraftin Kimmie - Sketch. * Papertake - 'Just the One'.... in this case 'Colour'! * Crafty Cardmakers Spotlight Challenge - 'Glitter and Sparkle'. 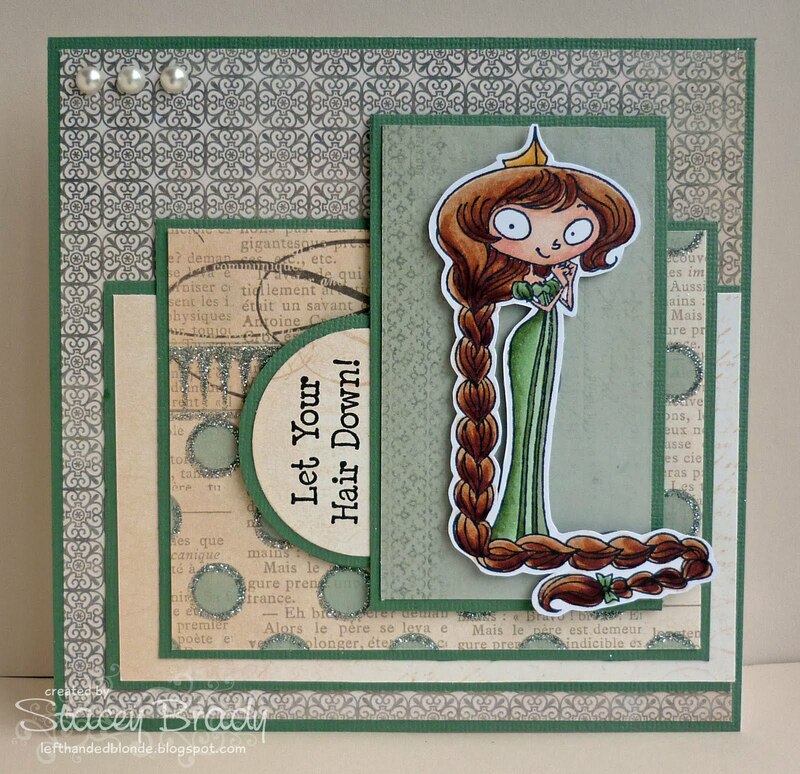 * Stampin for the Weekend - 'Vintage'. 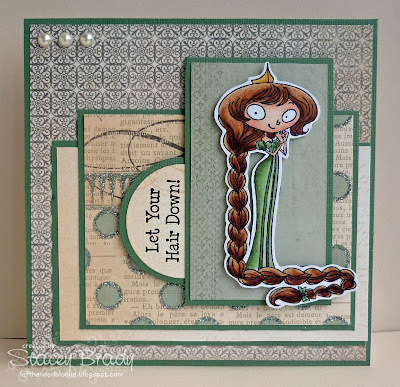 Stamps: 'Rapunzel' by Kraftin' Kimmie Stamps - available HERE from DTDF. Paper: 'Lost & Found - Portobello Road' by My Minds Eye - available HERE from DTDF. Copic Markers: E00, E02, E11, E29, E31, E33, E35, E37, E50, R20, R22, G21, G85, G94, YG23, Y17 - available HERE from Dies to Die For. Fab card Stacey, love the colours. Super gorgeous. Love those papers but the image is just too cute!! Such a sweet card Stacey. I love this cute image and the yummy papers! That's a wonderfull card Stacey! Really lovely! I think you did a great job w/these colors that arent your usual style Stacey! Its fun to try something thats out of our zone...especially when we pull it off!LOL! Love the colors, sentiment and image. So perfect all together!I spot the sparkly glitter. Thanks for joining in our Glitter & Sparkle spotlight at Crafty Cardmakers.